The Missouri Secretary of State provides an online business entity search tool that allows visitors to search and view details for business entities incorporated in the state of Missouri. Below is a step by step guidelines on how to use this business search tool. 1. The first step is to access the Missouri business search page by clicking here. The page looks similar to the screenshot below. 2. This form allows you to search for a business by "Business Name", "Registered Agent", "Name Availability" and by "Charter Number". For this example we will search by business name. So go ahead and select "Business Name" in the "Search" drop down field. For this example type the name "Factory Green" in the "Business Name" field and then click the "Search" button. The form also allows you to select an option from the "Include names" drop down field to search business names "Starting With", "All Words", "Any Words" and "Exact Match". For this example select "Starting With". The screenshot illustrates the process below. 3. Once you click the "Search" button, the results page will display a list of entities that match your search criteria above. The screenshot below illustrates this. 4. Click on an entity name to get further details like status, type, filing date etc. 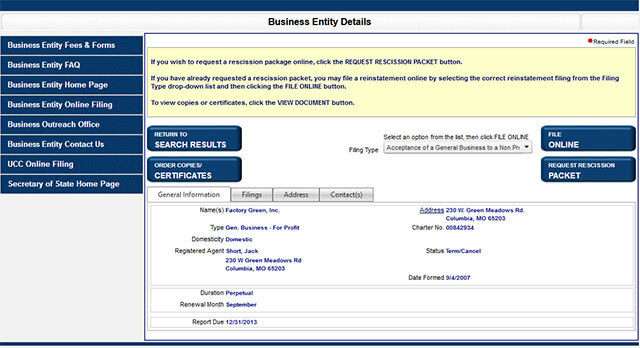 The screenshot below shows the business details page. 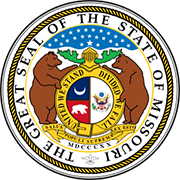 The Secretary of State of Missouri is an elected constitution office in the US state of Missouri. The Missouri Secretary of State is an executive branch of the government of the state and is also responsible for the statutory duties of the same. The current Secretary of State of Missouri is Jason Lander who was sworn in into the office in November 2012 and is a Democrat.